Starting a new thread because others ruined the first. Keep your issues out of this thread it is for posting wait times and general updates on rides so those planning what rides to hit next or if they should visit the park. What do you guys think crowd size will be like on 7/7 (next Monday, after the holiday weekend)? I'm hoping crowds will be pretty light on 7/7 because I will be there that day as well. I'm thinking they won't be too bad because it's tough to get off work at a lot of bigger companies the next business day after a holiday, but at the same time I imagine some people will go for the epic 4-day weekend and opt for having Monday off instead of Thursday, like I am. At the end of the day it's a Monday and it's not a holiday, so I doubt it will be too bad. Please guys, this isn't a 8 ball thread, this isn't a future trip planning thread. 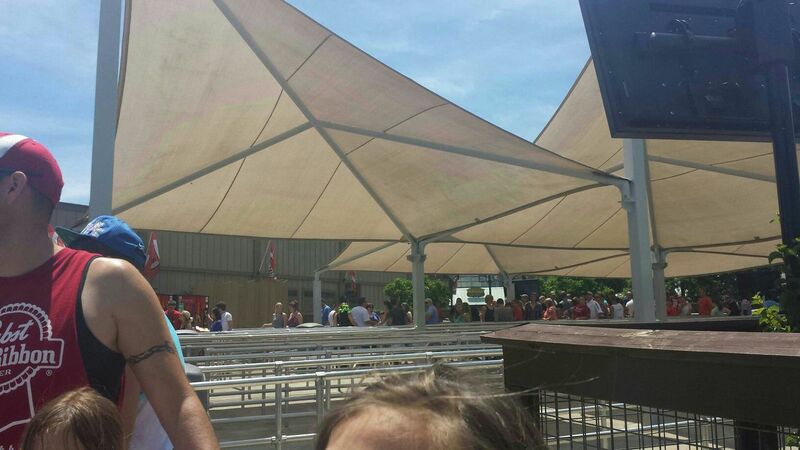 Current wait times for rides at Kings Island only. ^ That calendar has so many problems that I can't even begin to count them. For one, Fridays and Sundays are not equivalent to Saturdays; they are more equivalent to weekdays. For another, Fridays during Haunt are significantly less crowded than Saturdays, and Sundays in the fall are almost dead, not "moderate crowds". And weekdays in August don't start being dead until the middle of the month. Wow. I feel sorry for anyone who treats that as gospel. It'll probably be busy. It's following a 3 day weekend. I went on Monday 6/30, and crowds were light early morning and got a little heavier as people were getting off work. The longest line we waited for was 45min. Anyone from here there today that can give an update? From the webcams it look like Banshee's queue is about half full. I'd say its about a 35 min wait. It's cool out today, so that may keep people out of the water park. It's also free military today. Might be a busy one. Didnt realize its free military day. I was going to maybe swing by the park later this afternoon for a few rides on the adult side. Most military get off in about 20 minutes today except for mission essential, which have about another 1-2 hours. There are those on leave already but I'd imagine they will already be there or there shortly. What you see now will probably be what you get unless you see a spike in the next hour or so. The park is pretty crowded. Weather is perfect, though. There is still FUN to be had. What are some of the wait times? we may go see a movie instead. Banshee is short. All others are full queues. Banshee was 15 minutes. The Bat is two cycles. Racer is 5 minutes. Adventure Express line was almost out to the entrance. Dilerium is a few cycles. Vortex is ten maybe fifteen minutes. WindSeeker looks to be walk on. All of the smaller flats and family rides are lomg waits same goes for BLSC. Also from The Racer I saw a line waiting in the outside queue of FOF. Wait, whoa, wait. You're saying FoF is open? I didn't specifically go back there today but the signs out front said it would be closed today. There was a line that was quite large for it the whole time I was at the park. I never went down by it but I looked every time we went up a ride. It's good to see that it (might be) back open ahead of the big weekend. When it re-opened the day after the smoking motor issue, it continued to be listed on the sign out front even though it was operating. Be sure to let us know about Flight of Fear! I imagine, like yesterday, it will get more crowded later on. Fireworks are once again very big tonight, and there's the Dinos After Dark, and there's a midnight close.